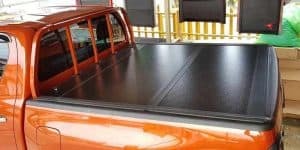 In many cases, many tonneau covers can be installed in less than a half hour, but that isn’t to say that this is the universal experience for every truck bed cover. For example, how to install a Tyger tonneau cover on a Ford F-150 will vary quite differently from a tonneau cover that’s designed specifically for trucks with Utili-track like the Nissan Titan. One of the first questions people tend to ask is, “Are any holes drilled in the truck?” Well, in most cases, modern tonneaus don’t require any drilling since most modern tonneaus clamp onto the body of the vehicle. That being said, some retractable tonneau covers require you to run an air hose through the bed of the truck, and while some trucks have plastic plugs to drill through, you may have to drill into the beds of some models. In fact, how to install folding tonneau cover variations or roll-up variations can definitely vary from product to product, which is why following the manufacturer’s instructions will be crucial. Still, knowing some of the basics of tonneau installation for each type can make the process easier, even considering that some models will only take about 10 minutes to install. In this guide, we’re going to show you some installation methods for some of the most popular tonneau covers on the market. Using the included solvent, clean the pickup bed rails. Install the weather seals on the corners of the bed. This will help the rails become more weatherproof. Place the driver and passenger side rails atop the pickup bed rails. Assemble the included clamps. Some clamps will require Allen or socket wrenches for assembly. Secure the clamps in place so that the tonneau rails are loosely attached to the bed rails. Grab the cover and align it so that it’s matched to the top of the cab-side of the pickup. Attach the cover. Tighten the clamps at the front fully using the required tools. Attach any remaining weather seals to the tailgate and close. Test the installation by rolling up the tonneau and unrolling it. There are two types of tonneau covers that can be classified under the tri-fold style. These two tonneaus can either have a soft body with a metal frame that’s typically aluminum, or they can be comprised entirely of a harder material like metal or fiberglass. Wash the truck bed thoroughly; a solvent can be very useful for this. Place the folded tri-fold atop the truck bed – positioning it as close to the cab as is possible. Fully unfold the tonneau so that the body of the tri-fold hard or soft cover fits evenly atop the bed. Once you know the tonneau is even, carefully fold it up so that it is closest to the cab again. Using the included clamps, attach the clamps under the tonneau and under the bed flange. As a general rule, avoid over-tightening the clamps at this stage. Unfold the tonneau one more time so that it covers the entire bed. Slide the included rear clamps towards the tailgate end of the tonneau and loosely tighten them under the bed flange. Pull the clamp lever down, which will ensure that the tonneau is secured to this section of the bed flange. Close the tailgate. Most tri-fold tonneaus will lock this way, and all you’ll have to do to unlock them at the tailgate end is to pull the latch. Roll N Lock is a retractable tonneau cover that’s very convenient to use. It has a very structured design that provides some excellent security for your truck, but it’s also important that you will need to do some drilling, and it’s a good idea to have an electric screwdriver. Overall, with one of these tonneaus, you’ll probably perform an installation over a couple of hours. Remove any factory-installed tie-downs at the front of the bed using a flathead screwdriver. Install the housing support brackets using bolts. These are installed into the bed holes that were exposed when removing the tie-downs. You’ll need a 7/16 wrench or socket for this part. Since the housing support brackets on both sides aren’t entirely watertight with the top of the bed rail, you’ll need to mold the included butyl strips so that a seal is formed. Attach the roll and lock housing unit to the bed rails of the truck. You should use a tape measure to ensure that the head unit is properly placed. Remove the lid of the housing unit by removing the Phillips-head screws at each end. Assemble the track bracket, which is constructed of washers, tangs, and brackets and insert the completed units into both of the exposed bed holes at the tailgate end of the bed. Ensure that the flat surface is at the top of the bracket. Hand-tighten the bolt loosely. Release the latches on the housing unit by turning it clockwise. Next, slide the driver-side and passenger-side tracks into position so that it aligns. Thread screws through the pre-punched holes and into the cargo nut. Position the tailgate extrusion on the tailgate and screw the self-tapping screws into the pre-punched holes. It’s crucial that this extrusion is lined up accurately. Close the tailgate to ensure that it’s lined up correctly. Grab the housing unit and shift it back so that the track ends overlap the tailgate slightly. Also move the tracks inwards as well so that they almost reach the tailgate extrusion. Tighten the rear clamps so that the tracks become level and flush. Tighten the clamps with an Allen key or wrench. Make them snug but not too tight. Install self-tapping screws into the housing so that it screws into the flange. Remove the wingnut that secures the pull strap – pull the pull strap until the tonneau cover meets the extrusion on the other side of the bed. It should latch into place. Reinstall the lid you removed as well as the lid screws using a Phillips screwdriver. Install the cargo bumper onto the housing unit using the screws and rubber washers. Drill two holes into the bulkhead using a half-inch drill bit. Run the included air tubes from the housing unit to the holes. Use a strong chemical like Aircraft Remover on the areas where you have to trim. Grab a heat gun and chisel and heat the area and chisel away the portion that you’ll be using for your tonneau. Sand away any excess spray-in material so that the portion of the bed you’ll need to use is completely exposed. Install the tonneau using one of the previously mentioned methods. Carry the head unit to the front of the bed right behind the cab. Ensure that the seal on the head unit is resting atop the bulkhead bed rail of the truck. Attach the included nuts into the channel of the included rail. The more nuts, the longer the bed of your truck will probably be. Attach the end rail caps to the rail with a nut that’s tightened using one of the nuts an Allen wrench. Attach the small bolt to the other end of the rail. Loosely install the stoplocks to every other nut. Disassemble the clamp and attach the topmost portion to the first nut without a stoplock. Continue this alternating pattern until you have all of the remaining nuts completed. Install the rail underneath the head unit and use the self-tapping screws to attach the components. Slide the first latch stop and attached half-clamp and while attaching the bottom part of the clap with a bolt, attach the rail to the flange of the bed. Attach the included bump stop to the clamp. Repeat the process with the adjustable latch stop in the middle. Attach the rear latch stop and half-clamp to the rear and install the bottom portion with the bolt. Attach the bump stop to keep it from moving. Close the tailgate to test the spacing. Most retractables come with a spacer so that you can determine the right fitment. Using an Allen wrench, tighten all of the nuts that are fitted into the rails. Make sure not to over tighten. To ensure the proper seating, apply pressure to the top of the rail. Push the stop latch as far as it will go towards the tailgate and tighten it so that it’s locked snugly. Tighten the middle stop latch. These should be at the same location as the opposite side. Finally, tighten the cab-side stop latch so that it’s flush with the head unit. Drill two holes into the bed – some beds have plastic plugs that you can drill two holes into. Run the drain tube from the head unit out the hole. Remove any bed extenders or factory components from the Utility-Track System. Install the 90-degree bracket into the tailgate-side of the track, the removed factory components, and then place the other 90-degree bracket onto the cab-side of the track. Place the cover atop the bed. Attach the mounting clamps to the first 90-degree bracket with an Allen wrench. Unfold and secure the tonneau to the rear 90-degree bracket. As you can see the installation of most of the different types of tonneau covers that you will encounter on the market will be fairly simple. Many of these options can easily be installed on your truck in 30 minutes to an hour by following the instructions that are outlined above. Before you begin, make sure that the tonneau cover that you purchased is compatible with your truck so that you do not install a cover that simply does not fit.